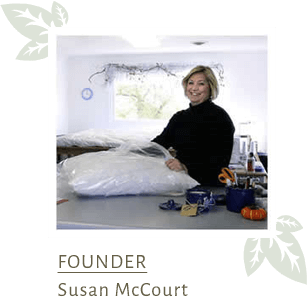 Susan McCourt, our founder, was simply looking for place to combine her love of natural living with a peaceful country home. She found Kerry Hills Farm situated amidst the rolling hills of central Wisconsin, a beautiful 35-acre farm with sheep contentedly grazing in the lush green pastures. Just North of Oconomowoc via Hwy 67, it was here her love of nature led to her belief that natural, organic products are the solution to many of our environmental and health problems. Before long, Susan began a woman-owned retail and Internet business to improve everyone’s quality of life with fine ECO-Pure™ Wool bedding. Her ECO-Pure™ Wool bedding products include only materials raised or grown on farmland in the USA to support local, American farmers. Offering the world's original patented product line of therapeutic wool bedding, every item is handmade using 100% ECO-Pure™ Wool and 100% ORGANIC cotton fabric. Our organic products are free from chemicals and toxins to protect your health and the environment. What started out as a passionate dream for Susan is now a growing corporation with 10 plus employees with increasing sales each month. Since 2009 Susan has allowed the employees to take a larger role in the day-to-day working of the company so that she can devote the majority of her time to consulting with customers on the value of the products and how they can have a fewer toxins in their sleeping environment for the best night's sleep possible. No one knows the products like Susan, and she is willing to share her expertise at anytime. The Wool Bed Company™ believes the success of our wool bedding products depends heavily upon the people who work for the company. By encouraging hard work in a relaxed atmosphere we have created a workplace culture resembling an extended family. Our ideas about lifestyle and merchandising continue to influence and inspire our company today. In today's world, people are constantly exposed to an ever-changing and expanding number of potentially harmful chemicals and toxins. Unfortunately, we have an inadequate understanding of how persistent exposure to such impurities will affect our health over time. This is why The Wool Bed Company's Surround Ewe™ Collection uses only the purest organic cotton and ECO-Pure™ Wool bedding materials and developed a complete product line that we believe will promote the well-being of babies, children and adults. Our 100% organic products can help to mitigate these risks and improve overall health. and Pillow Exchange Programs" designed to give our wool bedding customers the ultimate in customer service. It’s time you had a good night’s sleep. The Wool Bed Company™ is here to help give you comfortable, healthy bedding for your whole family. Contact Susan TODAY to learn more organic cotton and ECO-Pure™ Wool bedding products at 888.966.5233!